Mr Stephen Gerlach is an experienced Public Company Director having been the Chairman of Santos Ltd until his retirement in December 2009, and Elders Ltd until 2010. He is currently the Chairman of Adelaide Capital Partners Pty Ltd, Gerlach Asset Development Pty Ltd, Ebony Energy Ltd and a Director of Beston Global Foods Ltd and Beston Pacific Asset Management Pty Ltd. He was formerly the Chairman of Equatorial Mining Ltd, Challenger Listed Investments Limited, Amdel Ltd and others. He has also been a Director of a number of other public companies including ASX listed Southcorp Ltd, Independent Holdings Ltd (Group), AMP Australia and companies in the UK, USA and Chile. He was the inaugural Chairman of Foodbank South Australia Inc from 1999 to 2014, and a Director of Foodbank Australia Ltd. Board. A lawyer by profession, Stephen was a partner of the Adelaide legal firm Finlaysons and its Managing Partner from 1985 to 1991. Actively involved in a large number of community and professional associations, he is a member of the Australian Institute of Company Directors and its Corporate Governance Committee, a Trustee of the Australian Cancer Research Foundation, a Director of The General Sir John Monash Scholarship Foundation and Chair of The Psychosis Australia Trust. 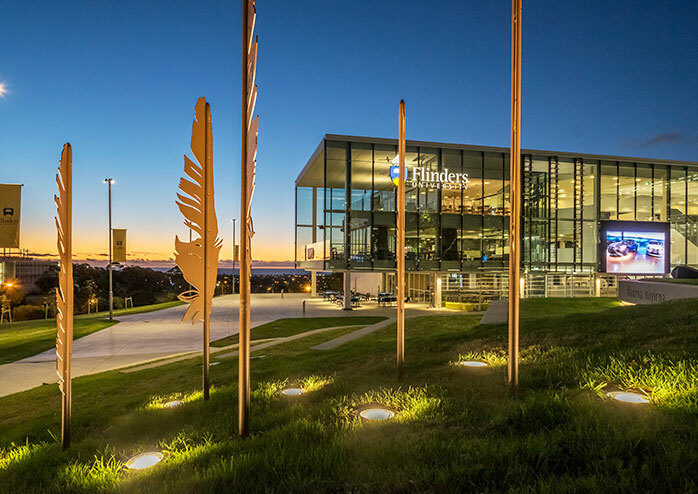 Globally focused and locally engaged, in a little over 50 years Flinders University has made a substantial and distinctive contribution to higher education in South Australia. It has also established a strong presence in the Northern Territory, particularly in the field of medicine. Research strengths include biomedical and clinical sciences, culture, policy and society, health and human behaviour, molecular science and technology, engineering, and water and environment. Leading Flinders researchers include biomedical engineer Professor Karen Reynolds, bowel cancer pioneer Professor Graeme Young and hydrogeologist Professor Craig Simmons, each South Australian Scientists of the Year in 2012, 2013 and 2015 respectively. Associate Professor Karen Burke da Silva was named the 2017 national university teacher of the year by the federal government. With a focus on offering exceptional student experience, Flinders has invested in contemporary facilities including a new student hub and plaza at the main Bedford Park campus – an environmentally responsible building featuring the latest learning technologies, superfast wifi, an array of study places, and vibrant social spaces. A state-of-the-art facility at Tonsley that centrally locates the University’s Computer Science, Engineering and Mathematics discipline, Medical Device Research Institute and Centre for Nanoscale Science and Technology alongside major business entities within an innovation precinct. A hub for entrepreneurs, next generation start-ups and employers through the Flinders New Venture Institute, it’s a catalyst for collaboration with local industries and manufacturers, and an impetus for economic transformation in South Australia. Flinders University excels in remote area education and has trained medical students in the Northern Territory since 1997. Its Northern Territory Medical Program allows students to complete a Flinders MD while remaining resident in Darwin. Today Flinders is the most significant external provider of tertiary education in the Northern Territory with major facilities on the Casuarina Campus of Charles Darwin University, at Royal Darwin Hospital and in Alice Springs. Flinders University is a highly regarded international provider of postgraduate education in Asia. Research collaborations in China are focused on Changsha and Shandong provinces. Courses are provided jointly with leading universities in China, Hong Kong, Malaysia, Singapore and Indonesia. Flinders has a particular focus on the delivery of social work and disability services courses in Indonesia, along with nursing, business and international relations. To mark the special relationship Flinders enjoys with Indonesia the Jembatan (bridge) initiative was launched in 2016 during Flinders’ 50th anniversary celebrations to promote cultural engagement between South Australia and Indonesia. Undergraduate and postgraduate courses are offered across six Colleges. Flinders University has some 2,700 staff and 25,000 students; more than 4,600 international students come from over 100 countries. The University’s main campus has on-site housing for 500 students, and its own international pathways college. The University’s commitment to making a positive difference to the world is captured in the strategic plan ‘The 2025 Agenda – Making a Difference’. It sets out four aspirations: to create a culture that supports students and staff to succeed, to foster research excellence that builds better communities, to inspire education that produces original thinkers, and to promote meaningful engagement that enhances our environment, economy and society. Approve significant commercial activities of the University. For further information, refer to the Flinders University Council Charter .